Food for People works with local grocery, pharmacy and health food stores to divert foods to us that would otherwise go to waste. As part of our Local Store Food Recovery Program, Food for People’s Driver travels to stores on a daily schedule to pick up excess food and deliver it to Food for People’s warehouse, where it is sorted and distributed through our Choice Pantry. This program partners Food for People with local stores to increase access to healthy food for those in need while cutting down on food waste in Humboldt County. This program brings in half a million pounds of food to the food bank annually, saving local businesses up to $40,000 in annual waste fees. In terms of environmental impact, this also helps divert up to half a million pounds of waste each year from landfill, which is an important environmental benefit for our county and one that will help local municipalities meet the goals outlined in California legislation on organic waste (AB 1826). Tax credits for the donations are an added benefit to business donors. 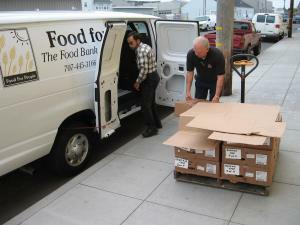 Approximately 20%-25% of the food distributed by Food for People is received through the Local Store Food Recovery Program. If you are interested in donating food as a grocer, retailer, or manufacturer, please contact our Operations Manger at operations@foodforpeople.org or call (707) 445-3166, and press 304. Local farmers, ranchers, and backyard gardeners donate close to 100,000 lbs of additional fresh, local food through our Gleaning and Plant a Row programs, a portion of which may have otherwise been composted or gone to waste.